Located in Iron County northwest of the town of Parowan, Parowan Gap is a three-mile-long pass transecting the Red Hills between Parowan Valley on the east and northern Cedar Valley on the west. A world-class gallery of Native American rock carvings is displayed at The Narrows on Parowan Gap’s west end and a trail of Cretaceous-age dinosaur tracks can be explored near the east end. The rock strata exposed within Parowan Gap underwent low-angle thrust faulting and folding between 45 and 100 million years ago during the Sevier orogeny, a mountain-building period caused by dense oceanic crust in the Pacific Ocean colliding with and moving beneath the lighter continental crust of North America. These rock formations include the Jurassic-age Navajo Sandstone and Carmel Formation (on the west side of the Gap), the Late Cretaceous-age Iron Springs and Grand Castle Formations, and the early Tertiary-age pink member of the Claron Formation. A long-gone stream carved Parowan Gap. This stream existed before the hills were here and may have been the ancestral, western part of Parowan Creek, a present-day stream draining Parowan Canyon near Parowan. Bounded by normal faults, the Red Hills began to rise relative to the adjacent Parowan and Cedar Valleys due to fault movement initiated during Basin and Range extension (beginning about 20 million years ago). Keeping to its established course, the stream continued to erode through the uplifting hills for millions of years until either the hills rose too quickly for the stream to keep cutting down, or the region’s climate became drier and the stream dried up, or perhaps both. Today, only during exceptional flood years does a small stream occupy the Gap. 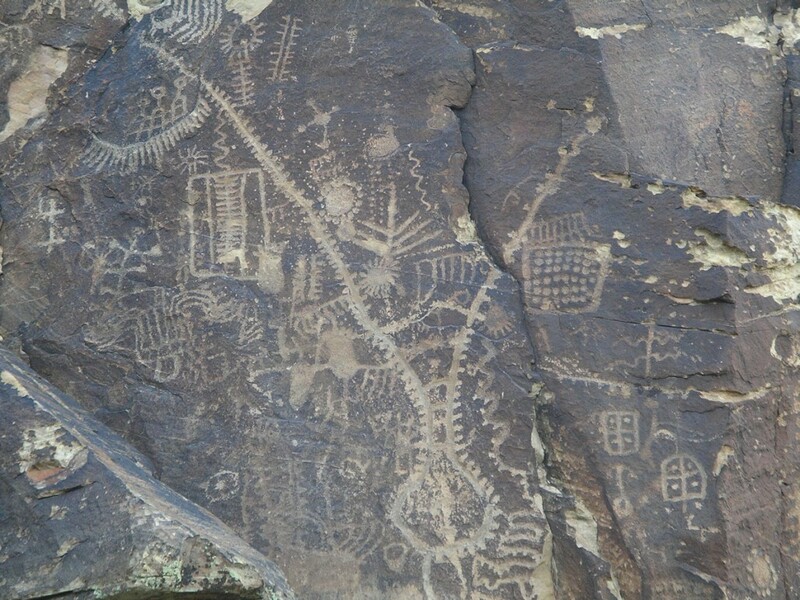 The Parowan Gap Petroglyphs site, managed by the Bureau of Land Management (BLM), is listed on the National Register of Historic Places for its importance as a cultural treasure and is widely recognized for the number and quality of its petroglyphs, with over 90 panels showcasing over 1,500 carvings. In 2014, the site was improved with interpretive signs, trail upgrades, and new restrooms. The carvings, cut into Navajo Sandstone at The Narrows, are thought to be the creations of multiple cultural groups over a lengthy period of time. Although some glyphs are possibly almost 5,000 years old, most researchers believe that people of the Fremont culture, who lived in the area approximately 700 to 1,500 years ago, carved the majority of them. To the modern-day Paiute and Hopi Tribes, this is an important historical, cultural, and spiritual site. Typical petroglyphs here are of geometric designs, embellished with dots and dashes, but there are also carvings of lizards, snakes, bear claws, mountain sheep, and human figures. The true meaning of many of the petroglyphs remains unknown. Do they represent concepts, ideas, or actual happenings; hunting, communal, or religious rituals; lunar and solar calendars or other astronomical events? The Parowan Gap Dinosaur Track Site, also managed by the BLM, has a trail that winds through dinosaur tracks exposed as natural casts on fallen sandstone blocks of the Iron Springs Formation. 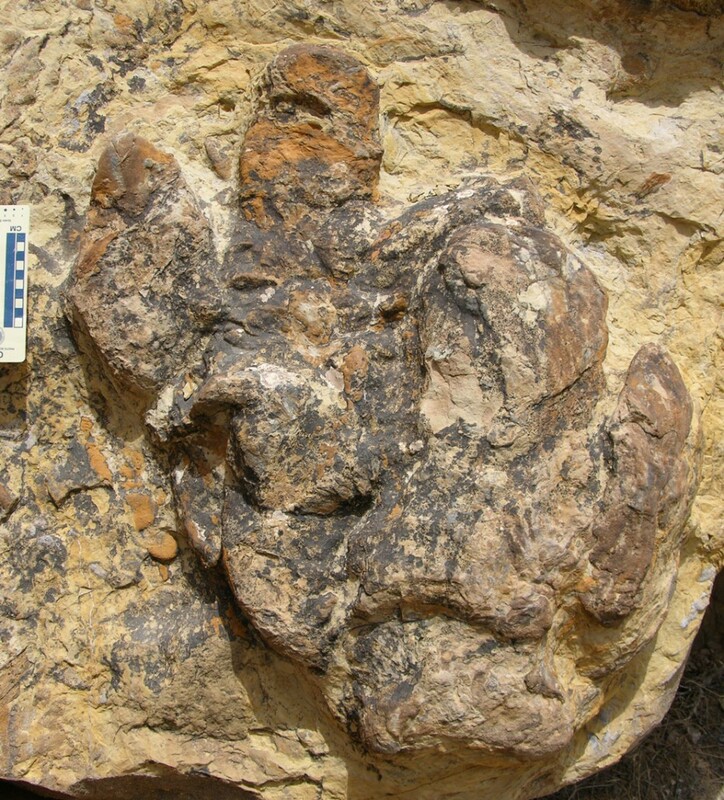 Such casts form when sediment fills the original dinosaur footprint and hardens into stone; it then becomes a three-dimensional replica of the dinosaur’s footprint. These tracks were left behind from dinosaurs walking in an area of muddy and sandy braided streams about 75 to 85 million years ago. Most of this area’s tracks were produced by ornithopods—very likely hadrosaurs (plant-eating duck-billed dinosaurs)—and a small number of tracks are from theropods (meat-eating dinosaurs) and ceratopsians (plant-eating horned dinosaurs). From southern Utah, travel on I-15 North, take exit 62 (State Route 130), just north of Cedar City. Turn left onto State Route 130 toward Enoch and continue for approximately 13 miles before turning right onto the road going to the Parowan Gap Petroglyphs. The petroglyph site is on the left just after traveling through The Narrows. Continue driving on Gap Road for about 2 more miles to reach the Parowan Gap Dinosaur Track Site. From northern Utah, travel on I-15 South, take exit 78 (Parowan), and turn left at the stop sign toward the town of Parowan. Drive into Parowan on Main Street for about ¾ mile until you reach the cross street of 400 North. Turn right onto 400 North; this street will become Gap Road soon after you cross under the interstate highway. 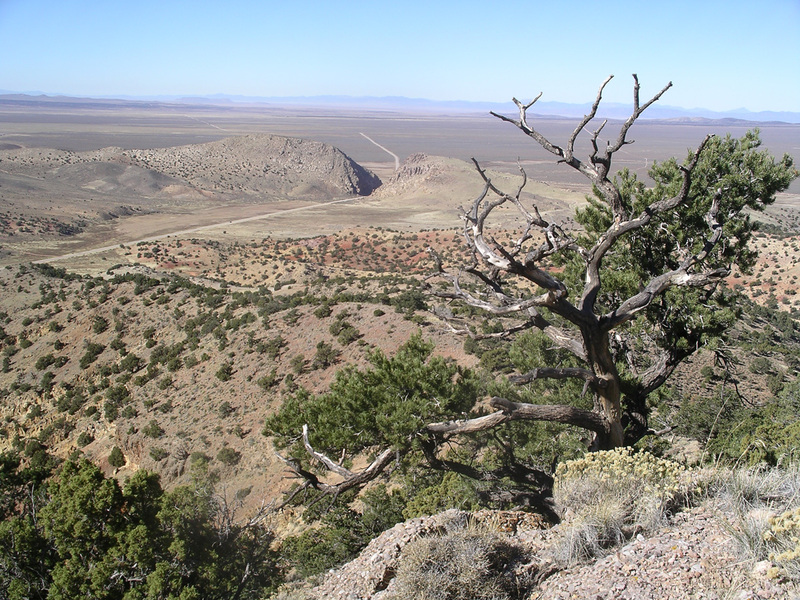 Continue on Gap Road for approximately 7 miles until you reach the east end of Parowan Gap. Continue for about ¾ mile to the Parowan Gap Dinosaur Track Site and then another 2 miles to the Parowan Gap Petroglyphs. Horizontal Drilling in Utah: Can Utah Compete with Surrounding States? Glad You Asked: Does Utah Really Use More Water Than Any Other State?